We kill all the caterpillars, then complain there are no butterrflies. In the video Edward Sharpe and The Magnetic Zeros performing Man on Fire. In the photo Eric West hotographed by PNP/WENN. Tyler Perry's Madea's Witness Protection New York Premiere. Photo caption from The Dead of Night by John Marsden. Title by Mascotes. ON STAGE Lenny Kravitz performing Low. RECENTLY IN MASCOTES Uni, Simple Minds. WE WATCHED A YEAR AGO Leo Hoffsaes & Loto Retina, St Vincent, Kim Ann Foxman. WE SUGGEST IF YOU MISSED Patti LaBelle and Michael McDonald, Wham, The Three Degrees, Eartha Kitt, Robert Palmer, Bikini Kill, Al Green, Robert Plant and The Honeydrippers, Right Said Fred. COVER PAGE: Lady Gaga by Marilyn Minter. Source The New York Times, The Culture Issue, 2018. Les Mascotes 8 - 31 Oct 2018. CALENDAR: Ben Whishaw by Willy Vanderperre. Source Another Man. RECENTLY ON COVER PAGE. In order of appearance: Brit Marling by Petra Collins. Source Glamour. 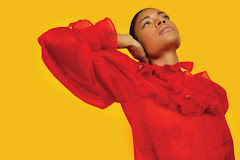 Naomie Harris by Erik Madigan Heck. Source New York Magazine. Les Mascotes. 2011-2019. Spale Miro Stevanovic and Mascotes. Simple theme. Powered by Blogger.